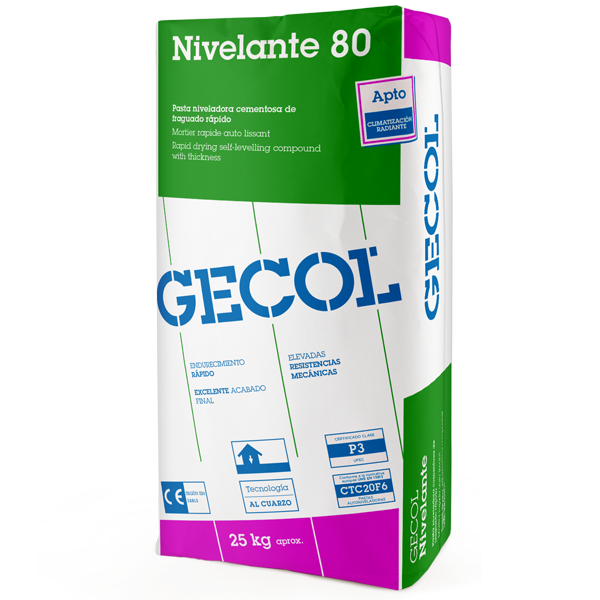 GECOL Nivelante 80 is a fast-setting cement mortar suitable for leveling, repairing and raising interior floors, on both new and existing surfaces. Very fluid and pumpable mortar, armed with glass-fibres, excellent self-leveling power for its application of 10 – 80 mm thickness in a single layer. Designed for the leveling of floors with radiant heating, as well as floating flooring on acoustic insulation sheets. It offers high mechanical resistance, good final finish, very smooth texture and excellent planimetry. Its fast setting means that the surfaces are free from residual damp, thereby enabling the installation of light flooring such as wood, linoleum, ceramic, natural stone, etc.